Visitors to London are often surprised to see a large warship moored in the middle of the Thames just upriver from the Tower of London. However, considering Great Britain's history as a sea faring nation and the fact that Britain long ruled the waves thanks to its Navy, it is altogether appropriate to have a Royal Navy ship in the heart of the capital. The warship is HMS Belfast, a World War II era cruiser. In the hierarchy of surface warships of that era, a cruiser would be about in the middle - - larger and more powerful than a destoryer but smaller and less powerful than a battleship. Cruisers were quite versatile and could be used for a number of tasks including convoy escorts, anti-aircraft defense for the fleet and shore bombardment in support of ground troops. Because of their speed and relatively powerful armament, they could also be used for independent operations such as commerce raiding. Since they were larger than a destroyer, they could carry more fuel and thus had a greater operating range. Cruisers could be divided into two categories depending upon their size and main armament, with th more powerful cruisers called heavy cruisers and the fast, more lightly armed cruisers called light cruisers. Belfast at 14,325 tons full load displacement and a main battery of 12 six inch guns would have been considered a light cruiser. 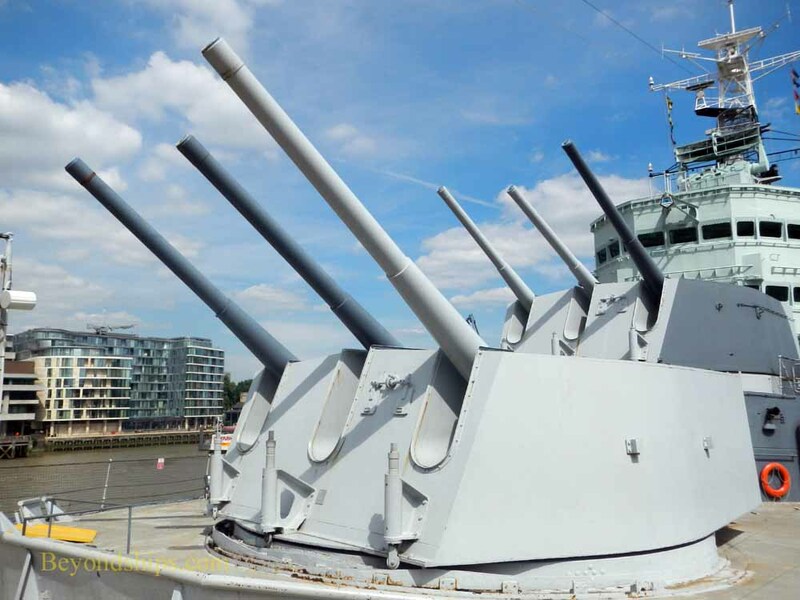 Today, HMS Belfast is a major tourist attraction in London operated by the Imperial War Museum.